If all other attempts to get your OneDrive for Business client in Windows 7 to "get it right" fail, here is a good final option. Or, if you want to restart it for another reason (changing folder choices, etc.) this will help. Please note, if you are having continual problems, definitely open a HelpDesk Service Request. If you’ve synced OneDrive for Business or a SharePoint site library to folders on your computer, you can stop syncing these folders at any time. 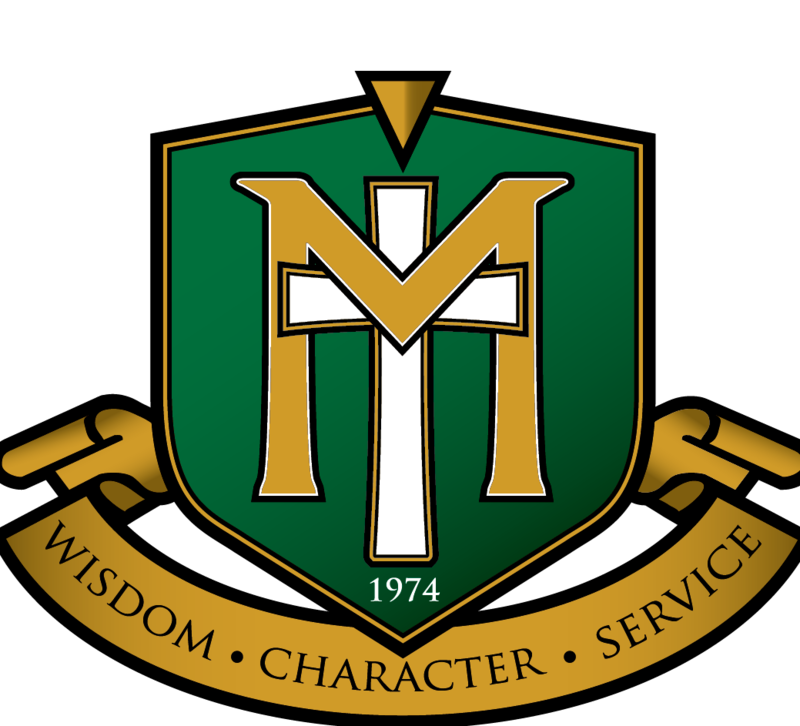 When you stop syncing a folder, you disconnect the folder on your computer from the library on the server. You can always sync the library to your computer again. Why stop syncing a library? Usually, you stop syncing when you no longer need to sync updates between the folder and the library on the server, or because you’ve completed a project. If something goes wrong with the connection between the folder and the library on the server, you can often fix the problem by stopping the current sync relationship, and start syncing the library again, as if for the first time. Note: If you’re having sync problems, you can also run Repair. Repair disconnects and reconnects all libraries you’re currently syncing. You can also pause syncing a folder. This allows you to temporarily stop syncing a folder without disconnecting it from the library on the server. You might pause syncing if you don’t want to use your system resources for syncing at the present time. You can resume syncing at any time. Syncing a OneDrive for Business library is a function of Windows and the OneDrive for Business app, and is specific to your computer. You can only pause and stop syncing from your local computer, not from the online app. Once you've stopped syncing a set of files, you can delete them from either your local computer, or from OneDrive for Business. If you delete a file from OneDrive for Business online, and then sync again, that file will be deleted from your local computer. You can stop syncing a library, but not individual files or folders under that library. Note: If the OneDrive for Business icon isn't visible, click the Show hidden icons button in the notification tray. If you still don't see the icon, OneDrive for Business might not be running. Go to Start, type OneDrive in the search box, and select OneDrive for Business. 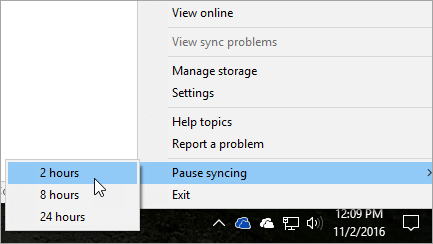 To keep the connection between your computer and the server, but stop syncing temporarily, follow these steps to pause a sync relationship. Right click the OneDrive for Business icon in the Windows notification area at the bottom of your screen, move your cursor over Pause syncing, and choose 2 hours, 8 hours, or 24 hours. Note: If the OneDrive icon isn't visible, click the Show hidden icons button in the notification tray. If you still don't see the icon, OneDrive might not be running. Go to Start, type OneDrive in the search box, and select OneDrive. 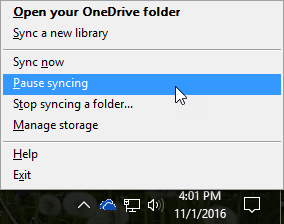 This pauses syncing for OneDrive for Business. To resume syncing, right click the OneDrive for Business icon in the Windows notification area, and then click Resume syncing. 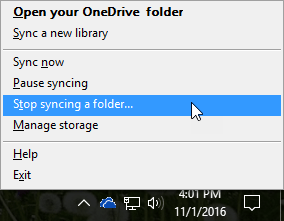 Right click the OneDrive for Business icon in the Windows notification area at the bottom of your screen, and then click Pause syncing. This pauses syncing for all libraries you’ve synced to your computer. To resume syncing, right click the OneDrive for Business icon in the Windows notification area, and then click Resume syncing.